This question appeared in the Facebook group “Macrobiotics” and I have decided to publish my response is here for the benefit of all to read because it is such a basic and common question, that I thought it might be helpful to many. First, it will be helpful to remember that there is no such thing as a “macrobiotic diet” and therefore there is nothing that is “not part” of it. Macrobiotics is instead about understanding how all things, including what we eat, relate to and influence us. As a result of this “macrobiotic” approach and understanding to life some have suggested eating habits and dietary choices for better health and prolonging life and chief among these have been standard dietary guidelines suggested by my father, Michio Kushi, which have benefitted many seeking to improve their health. The reason why a specific food item may not be included among those guidelines is based on the overall influence and effect such a food item may have relative to becoming healthier. Honey, especially if eaten in excess, may produce unwanted results, but of course, results will vary from person to person as we are all unique. Also, we all have various options available to us when it comes to different sweeteners that range from artificial sweeteners and refined sugar to honey, maple syrup, beet sugar and grain based malts and each of these produce different effects especially when eaten in excess. What food choice is most beneficial to us, from a macrobiotic relativistic (or, if you prefer, dialectic) point of view is obviously the one that negatively effects us the least ( or positively effects us the most ) in larger quantities and over longer periods of time. By experience, honey, if eaten in excess can cause chronic headaches as well other more serious issues overtime. 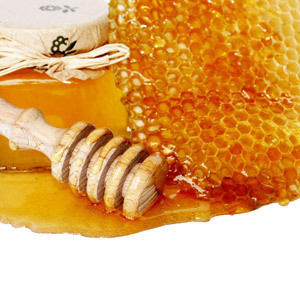 It is “safer” to choose maple syrup or grain-based sweeteners over honey as their impact is less though similar. Indeed grain-based sweeteners if eaten in excess can cause , for example, swelling in the feet among other things. But as we are all different then each of us must explore and discover our own limits (“non-credo”) and observe and monitor the effects of not just what we eat, but everything which effects us. To begin to explore, understand and play with life in this way is what we call “macrobiotics”. George Ohsawa, my father’s mentor and the man who re-introduced “macrobiotics” to the world, outlined various principles he discovered to help us better understand how all things in the universe influence us and how we influence the universe. He did so by offering the relativistic terms “yin” and “yang” among other ideas as a way to begin to understand how change and movement happens in the universe and as a way to connect seemingly disparate events and occurrences together. In this way, for example and historically speaking, Ohsawa and my father ( and others) have long promoted the importance and influence of food in our everyday lives especially in the role of health and sickness when it was commonly thought that food made little difference in one’s health at all. I know this is a lengthy reply but I wrote it because the question is common in that the subject, “honey”, can be replaced with any food item (e.g. red meat, ice cream, rutabagas, brown rice – or even snakes, insects, humans, rocks, etc… O_o!) or anything else that influences our life. “Macrobiotics” is a life-long endless experiential study and is not just about food but about all life itself. I hope this was helpful. We have been eating the Macro way for 2 weeks now. Very tasty food. My problem is that I am finding the subs for sugar are far from remotely being sweet. I honestly resent being advised that I cannot use honey, agave… I do Not over use these. In small quantities I do notbelieve they would be wrong to use with the Macro foods. As long as we are avoiding the ‘bigger’ issues of processed foods etc. I will use honey and or agave in small amounts. I think it would be of great help reading the text some more times. It is very carefully written and has a beautiful way of answering questions. Already the first sentence is important to understand and the “exploring” is, as I see it, a central point of view. An investigation of life, instead following rules of life. Beautiful text, to read and explore.